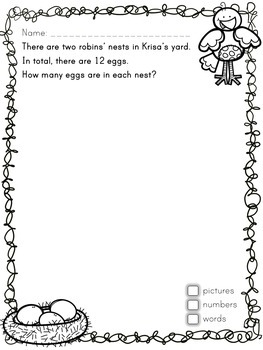 This resource has 21 pages of Spring-themed open math problems. Some problems are differentiated to have easier/harder versions. It has problems from each of the five strands: Number Sense and Numeration, Measurement, Geometry, Patterning, and Data Managment and Probability. These open math problems were created using the Ontario Grade 1 Curriculum as a guideline. Open Math Problems are useful for differentiation and make excellent three-part math lessons as a variety of possible answers lead to rich sharing sessions. Number Sense concepts include: addition, subtraction, fractions ("sharing equally"), skip counting by 2s. Measurement includes area and using the metre as a benchmark. Patterning includes creating and naming/labelling basic patterns. Geometry includes symmetry, 2-dimensional shapes, and 3-dimensional figures. Data Management includes using one-to-one correspondence to create simple bar graphs. Probability includes describing likely/unlikely events. Check out Primary Open Math Problems - a resource of over 200 pages using Ontario's K-3 math curricula as a guideline! The questions in this packet are unique and are not repeated in my Primary Open Math resource. I use this resource in guided math and individual conferencing. Remember to give feedback after your purchases in order to earn TPT points. Use them toward future purchases!